Historic Trondhjem Church is located near Lonsdale, Minnesota in Rice County. 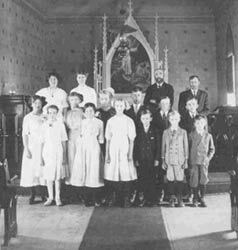 The church was built in 1899 by the Norwegian immigrant farmers who settled in what was then called Trondhjem, Minnesota and is listed on the National Register of Historic Places. No longer occupied by an active church congregation, the church is now under the care and restoration of the Trondhjem Community Preservation Society, Inc.
As a wood frame country church, with a simple, elegant design and painted white, it stands on a high hill along a gravel road, visible to the rural community for miles around. Its architecture and décor are clearly rooted in the Norwegian heritage of its founders. The ancient stave churches of Norway are reflected in its modified cruciform design, with a central short tower at its apex and a larger corner tower. Listed on the National Register of Historic Places and located across the road from the Historic Trondhjem Church, the cemetery was established before the church building. On September 2, 1876, the church minutes state that the congregation came to an agreement to locate the graveyard on Johannes Fossum’s land, on the boundary between Weathland sic. and Webster townships where they expected a road would be located at some future date. The road was indeed located there, and it now passes between the church and the cemetery. Here you will find listed all burials in the Trondhjem Cemetary since its beginning in 1876, compiled by John Dalby.